CS18AI is a compact (rack mountable) intuitive control surface, a 64 channel (4 banks of 16 faders) mixing solution for the StudioLive RM16AI and RM32AI rack mount digital mixers and Studio One digital audio workstation. No snake or loom needed, just an ethernet (CAT5) cable between CS18AI and your RM digital mixer. 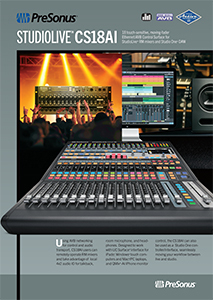 The StudioLive philosophy means being at home both live and in the studio, being easy to learn, and incorporating uniquely PreSonus workflows and features. Although you can navigate your mixes using traditional layers, a better solution is our unique Filter DCA groups, which bring the elements of the mix to you. Filter DCAs combine concepts of DCAs and view groups into an intuitive workflow designed to make your life easier when you’re in the heat of a live mix. For instance, rather than trying to remember which layer the lead guitar is on, select your guitar DCA Filter, and you'll have access to your guitar channels. This is going to change the way you mix! For more about Filter DCAs, see our UC Surface page. Through the power and flexibility of AVB audio networking, the StudioLive CS18AI can not only transmit control data but can also send and receive audio channels across long distances. You get two mic/line inputs with PreSonus’ remote-controllable XMAX™ preamps and two line inputs that you can use as sources for the talkback, 2-track playback, or other sources from front-of-house. The CS18AI’s two TRS line-level returns are shared with the monitor line outputs and headphone output and can be sourced from any RM mixer output, including the solo bus, main mix, or any aux mix. Every aspect of the CS18AI was designed to help you mix with ease and reliability. RGB Select buttons make it easier to identify channels, layers, and mixes based on color. True touch-sensitive faders know when your finger makes contact so the fader will never fight you, and you can experience real automation functionality in the studio. The CS18AI lights your way through mixing with 146 illuminated buttons; 16 high-res, 64x96 pixel scribble strips; a touch-sensitive, 4.3-inch (109 mm) LCD display; and 20 11-segment LED level ladders. If you need to control it, it lights up. CS18AI brochure. Please click the pic below.